… then, after asking, and emailing with, the good folk at St. Luke’s, we got the gig. We practised like folk possessed, obsessed over our running order (“let’s not have those next to each other. Three ukulele duets one after the other? It’s a bit much for people.” “Two traditional folk songs in a minor key? Nah, let’s break that up a bit”) and pontificated over posters, invited everyone we knew, people we’d never met, and people in-between, encouraged people to share our posters and thanked so many lovely people for promoting our gig. Finally the week came, and the weather forecast looked bad. As the week went on, it looked worse. On the night before our gig, we updated every bit of social media we’re on to say BRING WELLIES AND BROLLIES. Still, we visited poundland to buy some spare ponchos in case anyone had need (they did). Then it was the big day! We, and the kid, set off for Liverpool on the train with eight, yes eight different instruments in various bags and cases. The weather was glorious, but we weren’t fooled, and as the morning turned into afternoon there was a distinct change in the air and we could almost smell the rain. With help from Ambrose, Adam and Ash at St. Luke’s we set up. Marc had a very steep learning curve in “how to be a soundman” as we figured out which lead was plugged in where and what was for which volume and so on, but the ukulele pickups really helped the sound and our set up, two vocal mics and an ambient mic, was perfect. People started to arrive, and we played our first song, a mashup of “Sumer Is Icumen In” and “Miri It Is”, two mediaeval songs about how summer is wonderful… while it lasts. … and in fact, the “Sumer” lasted right until the end of the first half, through the interval, and until the start of the second half, at which point the heavens opened. Hard, full-on rain. But people who come to see Moss & Jones seem to be made of some pretty stern stuff! Very few got up and left and in fact, some of the little kids seemed to take great delight in running around, dancing in the rain. For all our running order plans, because of the rain we skipped two songs from our second half (one cover, Moonlight Serenade, and one original, Solemn Macramé Owl) so as to finish that little bit sooner. The awful thing was that about ten minutes after we’d finished, the rain stopped, and didn’t start again until about six o’clock that evening! Ah well! We thoroughly enjoyed that gig. 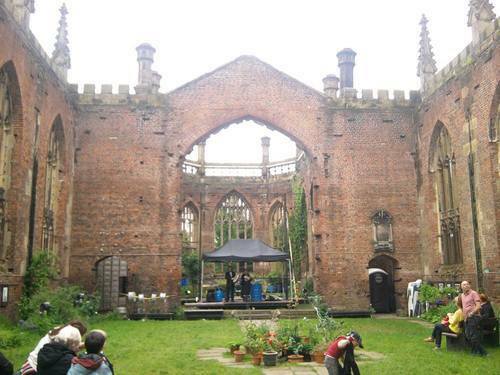 We had a chat with Ambrose after, the curator of the Bombed Out Church, and he said he’d love to have us back as our peaceful, folky vibe fitted in well with the surroundings and we did seem to draw people in. We’d love to come back too, possibly with support from a few other musicians, perhaps those with that same kind of quirky, family-friendly, festival-ish folk music vibe that you don’t tend to hear all that often on the local (indoor, evening) acoustic music scene. But as yet, there isn’t anything planned, and we’ll be sure to let people know if and when there is. What we’ve learned from this gig, because we think you always learn something from your gigs, is that we need to ask a friend to hand out flyers and the like during the performance, and ask another (or the same) friend to take some photographs. We’re also wondering if it’s worth actually asking people something along the lines of “if you’re enjoying the gig, why not tweet about it?” because lots of people said how much they’d loved our music, but with nothing online it’s hard for us to give that feedback to others. We also learned that the new setup with the ukulele pickups works wonders, and that with a bit of practice, we can certainly add the mandolin to our repertoire more often as it went down a storm. We’ve also realised that although we are a bit offbeat and quirky with it (and use ukuleles rather than guitars), we’re definitely more ‘folk’ than ‘indie’ or ‘pop’ or ‘oldie’ or ‘swing’. So many people there thought of us as a ‘folk duo’ that we might as well embrace it. We’d like to say, once again, from the bottom of our hearts, thank you. To all at the Bombed Out Church, and to everyone who came to support us. Also, to all the people who helped us promote our gig on twitter and on Facebook, even though some of you weren’t coming and even live miles away! It means so much to us to have all this help and support. Music reviews ... of our music! No more gigs from Moss & Jones but you can still buy their music from bandcamp until June 2016.